WhatsApp has not only helped to build and strengthen relationship between family and friends but it has also created a better communication channel between businesses and customers. In other to further make this better, WhatsApp announced sometime last year that it will be launching the WhatsApp business app and now the app is available for download. 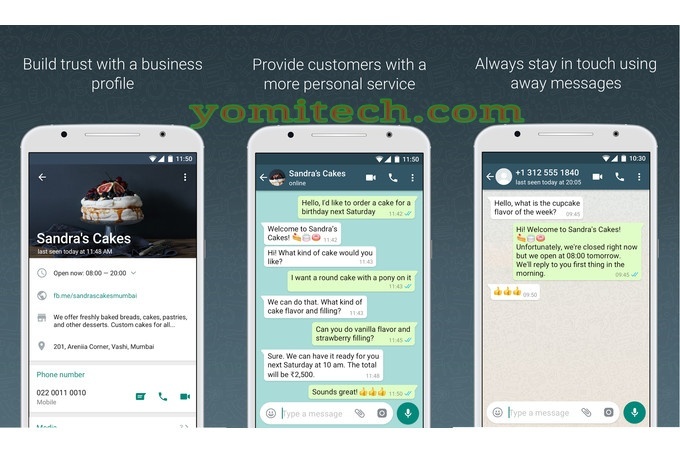 The WhatsApp Business is a free-to-download Android app for small businesses. The main purpose of this new app is to make it easier for companies to connect with customers, and also make it more convenient for the 1.3 billion WhatsApp users to chat with businesses that matter to them. Below are some of the features of the WhatsApp business. WhatsApp business is just the same as your regular WhatsApp app except for the few added features listed above. There is no need to download anything or make any changes to communicate with a business account. You will also continue to have full control over the messages you receive, with the ability to block any number, including businesses, as well as report spam. At the moment the App is only available on the Google PlayStore for Android users but there is no word from WhatsApp yet if or when it will be available for iOS users. Also, the app is available for download in only a few countries which are Indonesia, Italy, Mexico, the United Kingdom and the United States. Although, WhatsApp already promised to roll it out to other regions soon. Nonetheless, irrespective of the country you are, you can still download it from the direct link below.